Betsy Ross was born in Indianapolis, Indiana. She was commissioned a 2d Lt in the U.S. Air Force through the Air Force ROTC program at Tennessee State University, and went on active duty beginning in January 1998. Her first assignment was as Officer in Charge of Personnel Relocations and Employment with the 17th Mission Support Squadron at Goodfellow AFB, Texas, from February 1998 to February 1999, followed by service as Squadron Section Commander with the 15th Communications Squadron at Hickam AFB, Hawaii, from February 1999 to January 2002. Capt Ross next served as the Legislative Affairs Officer with United States Pacific Command at Camp Smith, Hawaii, from January 2002 to September 2003, and then as a Squadron Section Commander with the 11th Mission Support Squadron at Bolling AFB, Washington, D.C., from September 2003 to May 2004. She served as Executive Officer of the 11th Air Base Wing at Air Force District of Washington at Bolling AFB from May 2004 to July 2005, followed by service as Deputy Chief of the Military Personnel Division at Bolling AFB from July 2005 to August 2006. Maj Ross served as the Commander of the Manpower and Organization Flight for the 43rd Mission Support Squadron at Pope AFB, North Carolina, from August 2006 to November 2007, and then as Commander of the Military Personnel Flight for the 43rd at Pope from November 2007 to June 2008. Her next assignment was as Operations Officer for the 43rd Force Support Squadron at Pope AFB from June to August 2008, followed by service as Executive Officer for the Chief of Staff of U.S. European Command at Stuttgart, Germany, from August 2008 to September 2009. Maj Ross served as Executive Officer to the Deputy Commander of U.S. Southern Command in Miami, Florida, from September 2009 to June 2010, and during this time she was in Haiti when a devastating earthquake hit on January 12, 2010, and she was part of Operation Unified Response in the aftermath of the earthquake. 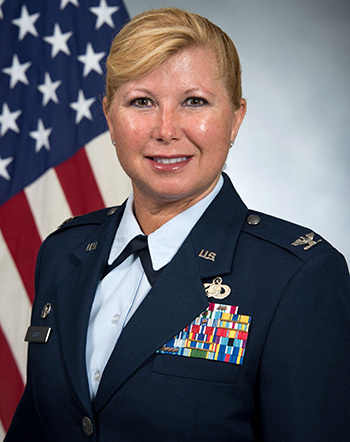 She next served as a Section Commander with the Air Force Element at Headquarters U.S. Southern Command in Miami from June 2010 to August 2011, followed by Air Command and Staff College at Maxwell AFB, Alabama, from August 2011 to June 2012. Lt Col Ross served as Deputy Director for Manpower, Personnel and Services with U.S. Air Forces Central Command at Al Udeid Air Base, Qatar, from June 2012 to June 2013, and then as Commander of the 335th Training Squadron at Keesler AFB, Mississippi, from June 2013 to July 2015. She is currently serving as Deputy Commander of the 81st Mission Support Group at Keesler AFB. Major Dorene Betsy J. Ross distinguished herself by heroism involving a voluntary risk of life at the Hotel Montana, Port-au-Prince, Haiti, on 12 January 2010. On that date, Major Ross was at the house of the United States Ambassador to Haiti when a magnitude 7.2 earthquake overwhelmed the Haitian capital, causing extreme damage and irredeemable destruction throughout the city. Major Ross's first humanitarian act was to render first aid to an injured officer that was transported to the Ambassador's residence from their hotel in downtown Port-au-Prince. Knowing that members of the United States Southern Command traveling team remained unaccounted for and possibly injured in the earthquake, she then proceeded through the damaged city, walking the final four miles through severely wrecked infrastructure and debris to reach the Hotel Montana where members of her group were lodged. With complete disregard for her own safety, Major Ross, despite severe damage to the hotel, unknown stability of the remaining structure and the continuing tremble of aftershocks, unhesitatingly searched for missing members of her team. She combed through rubble of the 145-room hotel, and amazingly, heard the voice of an airman who had been trapped for more than five hours. Assisted by two Haitians and a Frenchman, Major Ross extricated the injured airman from the rubble and led him to safety resulting in his survival. Major Ross then continued to search the area for other survivors. The exemplary courage and heroism displayed by Major Ross reflect great credit upon herself and the United States Air Force.